The best part of messing up is getting to make it up the next day!!!! I woke up this morning and decided that this weekend won't break me down and ruin all my hardwork from during the week. 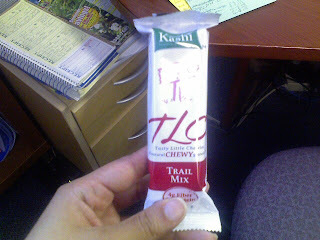 For Bfast I had a Kashi Trail Mix Bar with my usual Coffee; total of 195 Calories. While I was working at the gym, I squeezed a workout in. I did the Circuit for 35 minutes, 50 situps, and stretch and burned 382 Calories. I signed up this new girl today whom also has PCOS and goes through the same challenges that I do when it comes to losing weight. She seemed really cool and I told her she better come next Saturday. I love when members close to my age join. After work I did some Grocery shopping and stocked up on healthy yummy food for this weekend and the work week. 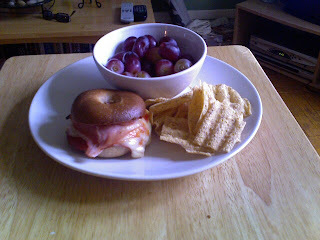 For Lunch I had a 100 Calorie WW Bagel with 2 slices of Swiss Cheese, Boars Head Low Salt Ham, and Ketchup (some people think it's gross but I love it when my sandwich is toasted) with Grapes and French Onion Sun Chips: 530 Calories. 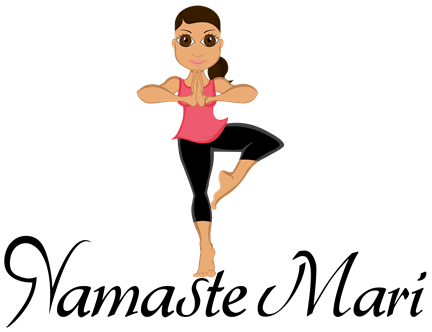 I just want to thank everyone who reads my blog for keeping me motivated and for having such inspirational blogs that give me great ideas on how to stay healthy. Oops, posted as Mike. I was trying to say that you are doing a great job! Very proud of you!